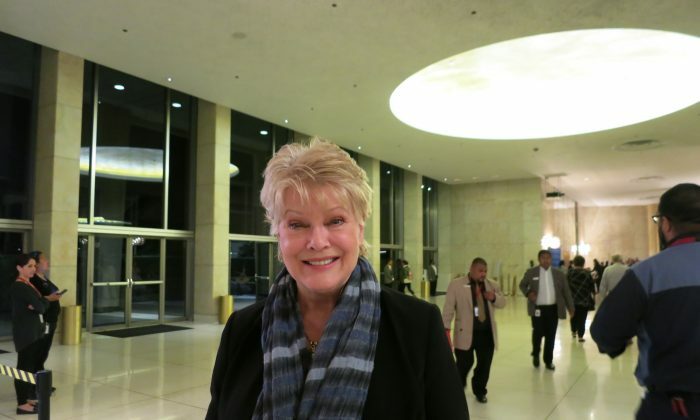 LOS ANGELES—Actress and singer Gloria Loring had wanted to see Shen Yun Performing Arts for a long time since hearing many good things about the production. This year she finally attended the performance at Dorothy Chandler Pavilion in Los Angeles. “I am so glad I am here,” Loring said on April 10, opening night. The New York-based classical Chinese dance company performed in Los Angeles as part of its 2019 world tour, in which six equally-large contingents are set to travel to more than 130 cities to showcase 5,000 years of traditional Chinese culture through the arts. Loring is an American singer and actress whose career in television and music has spanned more than five decades. She is best known for Liz Chandler on “Days of Our Lives” for five years in the 1980s. Her duet with singer-actor Carl Anderson “Friends and Lovers” reached number one in 1986. As a musician, Loring enjoyed hearing the unique sounds played by Shen Yun’s orchestra. “The orchestra and the music is absolutely gorgeous, just absolutely and beautifully played,” she said. Shen Yun’s orchestra combines both classical Eastern and Western instruments, and draws upon the strengths of the two distinct musical traditions. Chinese instruments play the melody on top of the harmonic arrangement of a Western orchestra, producing a rich and resonant sound. The music complements the dancers on stage, who also left a deep impression on the actor-singer. “I am completely impressed with how beautiful it is, unerringly beautiful and graceful,” Loring said. Loring also enjoyed the stories depicted by the company, which traversed thousands of years of Chinese civilization. The emcees’ bi-lingual explanation of these stories helped Loring immerse himself in the culture, she said. One story stayed with the entertainer. “I was very touched by the young woman who was practicing her faith and they broke her hands, and hurt her, harmed her,” Loring said. Loring was referring to a story titled “Goodness in the Face of Evil” depicting the imprisonment and torture of a young lady in China because of her faith in spiritual practice Falun Dafa (also known as Falun Gong). Practitioners of Falun Dafa have been brutally persecuted in China since the practice was banned by the communist regime in 1999. Since then, a sweeping nationwide crackdown has led to the harassment, detention, torture, and even death, of countless of practitioners in the country. Despite the cruel reality of events in today’s China, the story presented by Shen Yun ends in a message of hope. Enriched by the sights, sounds, and emotions conveyed by the performance, Loring was all smiles. “I am so happy I am here,” she said.